MEDFORD -- Experience is a key factor at the NCAA Cross Country Championship Race, and Tufts University senior Jesse Faller (Burlington, MA) has plenty of it. 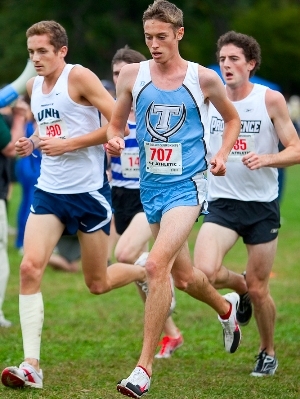 Faller will represent the Tufts University men's cross country team at the 2009 NCAA Division III Championship Race on Saturday (Nov. 21) at the Highland Park Golf Course in Cleveland, Ohio. The race will mark the third consecutive year that he has run at Nationals. He finished 18th at the NCAA race in 2007 when Tufts qualified as a team. Last year, he raced individually and placed 35th. Both were All-American performances. "Nationals is the kind of race where experience is extremely valuable," Faller said. "Because there's such high expectations on everyone to do well individually and as teams, it's a huge mental game. Some people thrive on it, others fold under the pressure. It is without a doubt the most competitive, stressful race of the season. It is key to just focus on the top 40 and not worry about the masses of people scrambling behind you. I know that I learned a great deal from my last two NCAA's, and I hope that my experience will help this weekend, both in terms of confidence and strategy." Faller finished fourth with a time of 25:26.8 at the NCAA New England Region Qualifier this past Saturday (Nov. 14) at Twin Brook Recreation Center in Cumberland, Maine. He was just 10 seconds behind 2009 regional champion Edgar Kosgey from Williams College, who won with a 25:16.2 time. A six-time All-American in cross country and track & field combined, Faller isn't planning on changing his typical approach to racing at the NCAA's this weekend. "My strategy is pretty much the same for just about every meet I run, from small invites to Nationals, and that is to get out well, sit right off the leaders, and put myself in a good position to finish high," he said. "I plan on putting myself in the top 20 or 30 early on and hopefully remaining there for the whole race. The race usually has a relentless pace to it, so once people start dropping off in the third and fourth miles, it will be key to have no gaps and stick right with the leaders." Faller grabbed the last All-American position in last year's NCAA race, placing 35th with a 24:59.89 time over eight kilometers at Hanover College in Indiana. As a sophomore in 2007 at Saint Olaf College in Minnesota, Faller was first for the Jumbos and 18th individually with a 25:03 time. The 18th place at Nationals is the best finish by a Tufts runner since Nate Brigham was 11th on the same course at the 2002 NCAA Championships.